Accepted Scientific Name: Stenocereus thurberi (Engelm.) Buxb. 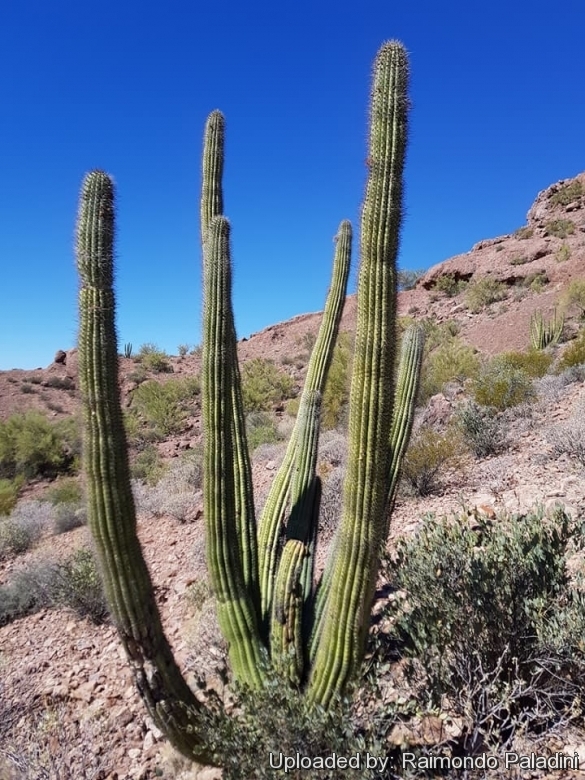 Growing habit, Arizona, USA. The habit of branching just at the base is unusual in this genus, in which most of the species have definite, though often short, trunks. Origin and Habitat: The species is from south-western Arizona to northern Mexico in the Sonoran desert (Sinaloa, west Chihuahua, southern Baja California and Baja California Sur ). Altitude range: It grows at elevations between sea level and 1,470 metres above sea level. Habitat and Ecology: The species is widespread and locally dominant on slopes and plains in Sonoran desert scrub, coastal, foothills thornscrub, and tropical deciduous forest. At the northern end of their range, the plants are restricted to rocky slopes and cliff ledges where night-time radiation of heat protects them from frost. In open desert vegetation most branching is at or near ground level. In thornscrub, most branching occurs 4 m above the ground. slightly above the level of the surrounding tree canopy. Part of the species range is affected by land-use change for agriculture and clearing and planting of buffel grass (Pennisetum ciliare) for cattle forage and subsequent fires in central Sonora. Some of the densest populations have been lost, but most of the range in not under threat. This cactus can withstand —4°C though the stem tips are frost sensitive. The frost sensitivity means that at its northern extreme of its range, it is found below 1000 m on south-facing slopes. 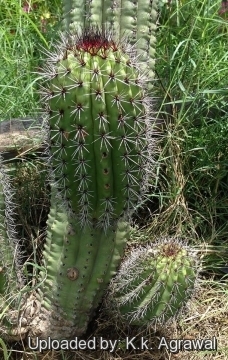 Pilocereus thurberi (Engelm.) Rümpler in C.F.Först. 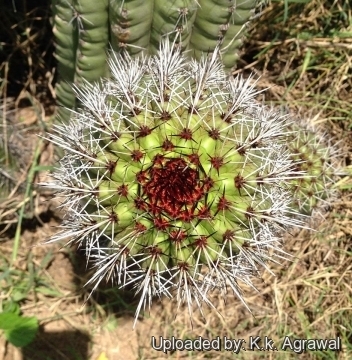 Description: The organ pipe cactus Stenocereus thurberi is a large shrubs or treelike cactus usually without a definite trunk, that shows latitudinal variation in growth form, from a multi-stemmed shrub sending up from the base 5 to 20 branches 3 to 8 meters high in dry northern habitats to a ten metre columnar arborescent cactus in tropical deciduous forest. The habit of branching just at the base is unusual in this genus, in which most of the species have definite, though often short, trunks. The flowers, which appear from March to August, are followed by the large delicious fruit much prized by the native, who knows it as pitahaya or pitahaya dulce. Two subspecies are recognized, the nominate form and subsp. littoralis (K.Brandegee) N.P.Taylor. The latter subspecies is considered by some experts to be a separate species. Branches: Erect or ascending, green, 1-8 m high, 15 to 20 cm in diameter, the basal ones usually simple but occasionally with lateral branches, this doubtless being caused by injuries to the growing tips. Ribs: Numerous, 12 to 17(-19), rather low but sometimes 2 cm high, rounded to acute, separated by narrow intervals forming more or less noticeable tubercles. Areoles: 10 to 15 or rarely 30 mm apart, large, sometimes becoming 1 cm in diameter, circular, brown-felted, more or less glandular, the whole areole becoming a wax-like mass within one or two years. The exudate producing dark red to black encrustation on the spines. Central spines: One to three, lowermost one up to 5 cm long. Radial spines: Seven to nine 1 cm long. Flowers: Funnelform, white to pale lavender 6 to 9 cm long, 6 to 7 cm in diameter, borne on the upper portion of the stem but sometimes 3 dm below the top. Night-blooming but remaining open the following day. Outer perianth-segments broad, reddish, imbricated, gradually passing into the scales on the tube. Inner perianth-segments white or light purple with nearly white margins and bases, widely spreading or even turned back at the apex, broad, obtuse. Necta chamber relatively large, its secretion copious. Filaments short, numerous, erect, white, borne all over the throat, 2 to 2.5 cm long. Lower part of flower-tube or tube proper smooth within. Pericarpel tuberculate, bearing small, ovate, acute purplish-red scales, these with white and brown hairs in their axils. Blooming season: Flowering occurs mostly from May to June (but recorded March-December) and bats are the main pollinator. Most plants reach reproductive age when 2-2.5 m tall (15-35 years old !). Fruit: Globular, 4 to 7.5 cm in diameter, edible, very spiny, olive without, crimson within and ripens in late summer. When mature, the fruit loses its spines and shows the red pulp. Seeds: Dark brown to black, shining, 1.8 to 2.5 mm long. Stenocereus thurberi (Engelm.) Buxb. : (subsp. thurberi) is larger, to 8 m high with stems 15-20 cm in diameter. Distribution: Arizona, mainland of Mexico, and upper peninsula of Baja California. Stenocereus thurberi f. cristatus (P.V.Heath) P.V.Heath: Crested form. The crested forms are cultivated for their beautiful stem with pronounced sculpture effects. Stenocereus thurberi subs. littoralis (K.Brandegee) N.P.Taylor: is much smaller, usually less than 3 m high with stems only 5-7 cm in diameter. Distribution: Southern tip of Baja California Sur. 7) Burquez Montijo, A. & Felger, R.S. 2013. Stenocereus thurberi. The IUCN Red List of Threatened Species. Version 2014.2. <www.iucnredlist.org>. Downloaded on 17 August 2014. Cultivation and Propagation: Stenocereus thurberi is easy to grow but not very cold hardy (Resistant as low as -4°C for a short time). Hardiness: Reputedly sensitive to frost, but less so if kept on the dry side prior to, and during, cold weather (hardy to -4° C for short periods). However warmth throughout the year will increase the grower's success (8-12°C during rest season). During winter month, put them in a cool luminous place and encourage them to enter winter dormancy by withholding water and fertiliser over the winter as they will etiolate, or become thin, due to lower levels of light. Garden uses: It is an excellent plant for container growing. It always looks good and stays small. It look fine in a cold greenhouse and frame or outdoor in a rockery. Other uses: The Pitahaya (The fruit of Stenocereus thurberi) is one of the most popular desert fruits. The fruit pulp is sweet and fleshy and is eaten fresh and dried. It can also be made into jam and fermented into a wine. Pitahaya is a general term used in Mexico for fruits of various columnar cacti. This word is of Carib or Haitian origin and appeared in print as early as the 1530s. The species is used by the Oòdham, the Seris and the Mayos for several purposes. The woody ribs have been used, as a construction material, and boat caulking has been made from the cortex of the stem. 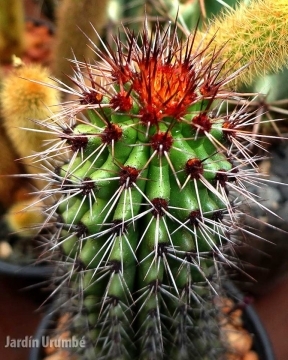 Stem sections of Pachycereus pringlei and Stenocereus thurberi are used in the same way for general aches and pains. Propagation: Division, direct sow after last frost. The seeds are quite easy to germinate and grow. Seeds germinate in 7-14 days in spring. Germination is inhibited as long as the seeds are embedded in the pulp but is high for cleaned seed. The seeds require light and germination is somewhat enhanced at hight temperature (35°C and 40°C) and depressed at 20°C. No germination occurs at 15°C. Remove the glass cover gradually as the plants develops and keep ventilated, no full sun for young plants! To make a cutting twist off a branch and permit it to dry out a couple of weeks, lay it on the soil and insert the stem end partially into the soil. Try to keep the cutting somewhat upright so that the roots are able to grow downward.